Peter Hamstead and engineer Tim Steer’s clever all-analogue design effectively enables the end user to create their own take on an overdrive pedal, as it presents a choice of three different clipping circuits, ±18dB of treble and bass EQ and further pre-drive tonal-shaping, plus three boost options. The tonal range on offer is vast, running from almost clean all the way up to metal/fuzz, via all the stages you’d expect to find in between those extremes. The steel casing looks capable of standing up to life on the road, and the switches are set well away from the optical OptoKick footswitch, which was designed by TheGigRig to add silent switching. Power comes from an optional 9V, centre-negative power supply with a current draw of just 55mA, and a red LED indicates when the pedal is active. There’s also an internally set option to have the pedal power up bypassed or active. There are five knobs labelled Tone, Bass, Treble Gain and Volume. By default, Bass and Treble function as you’d imagine they would, but they can be switched pre or post the drive circuit — more on that later. The Tone control always regulates the amount of high-frequency content hitting the drive circuit, while Gain determines the drive level, and Volume lets you balance the result against the bypassed sound. That’s mostly straightforward, but what of those three mini toggle switches? The first labelled ‘C1, C2, C3’ relates to the three clipping modes. C1 works in the way most diode-clipper pedals do, to provide symmetrical distortion — the positive and negative half cycles are subjected to the same treatment you’d expect when overdriving a class-A/B valve output stage. C2 adds asymmetry by clipping a half cycle of the signal, like an exaggerated version of what happens when you overdrive a class-A preamp. At lower settings it retains picking clarity, but at higher gain levels it becomes more fuzz-like. C3 combines two clipping circuits with the aim of emulating a valve amp pushed hard, and this is perhaps the most natural-sounding option. The most polite sound is obtained when the symmetrical clipping option is engaged (setting C3 has a little more attitude and note definition) and I preferred that for most things. The C2 asymmetrical setting works well at lower drive settings for delivering big, ringy power chords and leans towards a more aggressive ‘fuzz-stortion’ at higher drive settings. Getting exactly the right overdrive character means experimenting with the EQ and its placement in the signal chain. The centre switch determines where in the circuit the two-band EQ sits: PR places it pre the overdrive stage, while PO places it post. If you’re after a Tube Screamer, for example, you might try the EQ pre-drive and roll off some of both the top and bottom end. For more of an OCD-style, gentle, bluesy overdrive, putting the EQ after the drive and then using Tone to treat the pre-drive signal to remove excessive high end works really well. In the centre switch’s middle position, the pedal is reconfigured as a clean boost with the EQ and the Tone control bypassed. That leaves switch three, which provides three fixed-gain options at the input: X1 is unity gain, X2 doubles the gain and X5 boosts by a factor of five. 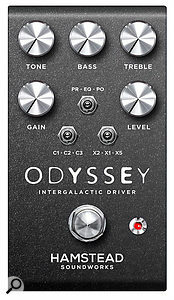 I was initially a little sceptical about having so many switchable options, but it doesn’t take long to get a feel for the controls and, once you have, you can coax just about any style of overdrive from the Odyssey — I dutifully tried all the switch combinations and was pleased to learn that they all sound significantly different! 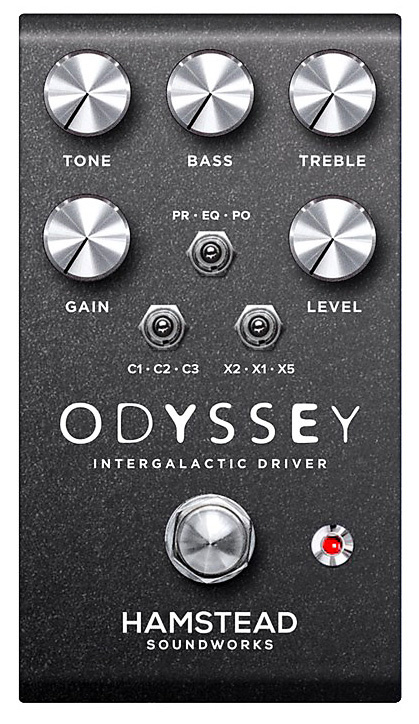 There’s really very little here not to like: the Odyssey is a classy, compact pedal that covers a huge amount of tonal ground in a very clever and intuitive way. The huge flexibility could make changing sounds a touch fiddly in a live situation, especially as there’s a noticeable volume difference between the three clipping options, but it could be absolutely wonderful in the studio, where this pedal could easily stand in for three or four different types of overdrive/distortion, or a clean boost with EQ. It’s been said that the world has more overdrive pedals than it needs — but Peter Hamstead’s unique take on the genre might just provide you with a reason to buy one more!